Backer says it would be worth the billions in investment, save and revitalize a dying lake. Skeptics question the science. The first thing Todd Parker acknowledges is that his proposal is a bit unusual. The second is that, regardless, he’s certain it can be done. “Big ideas are worth approaching,” he says with a smile. His, though, might just be the biggest environmental project in the United States: building a city in the middle of Utah Lake. Parker, an IT consultant and Provo native, has drafted the plan over the past decade. Last month, he submitted a 239-page initial report to the Utah Department of Natural Resources. And maybe by 2060 or later, he envisions a half million people living in the new community. Done right, Parker’s proposal could rehabilitate the long-polluted waterway. Done wrong, the whimsical plan could be agony, spending billions of dollars on a foundation that slowly sinks. Utah Lake is the largest body of freshwater in the state. But in recent years it has been plagued by toxic algal blooms spreading across the surface. It’s a problem that was aggravated by man. From the 1890s through the 1950s, cities surrounding the lake dumped raw sewage into the water. A steel mill began discharging heavy metals there, too, and contamination from nearby farms seeped downstream (and continues to today). Because the lake is so shallow — and loses roughly half the water it contains to evaporation each summer — those sediments are easily stirred up by heavy winds. 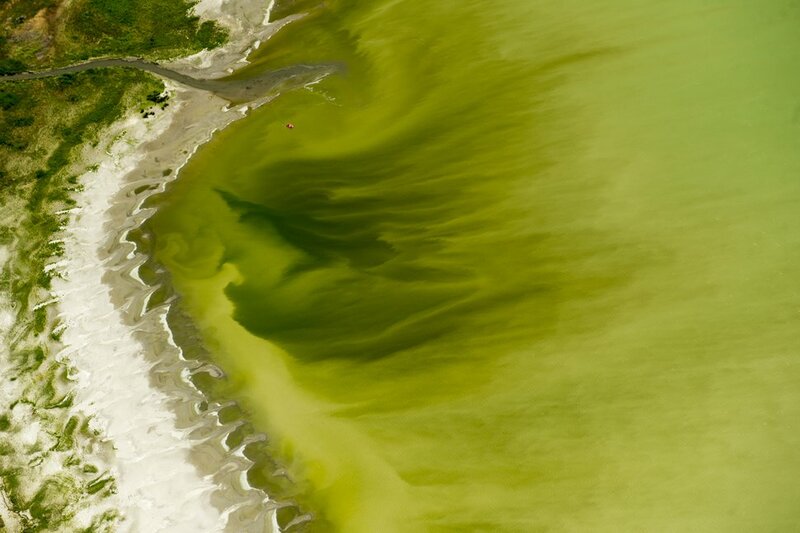 Microscopic algae and bacteria then feed on the minerals and produce massive slicks, like the 2016 bloom on Utah Lake that sickened more than 100 swimmers. Millions of dollars have been spent over the past eight years trying to repair the damage by reintroducing native fish, removing invasive plants and carp and studying the sources of wastewater runoff. Some of the fixes have worked, Holcomb said, but “it will be multiple, multiple decades” before the issue is entirely resolved. Parker grew up in Springville not far from Utah Lake. His family would pack up the car and head to Lincoln Beach about three or four times a month. Parker would swim out as far as he could, roast marshmallows on the beach with his brother Ben, fish with his dad. (Rick Egan | The Salt Lake Tribune) Todd Parker talks about plans for islands and a city on Utah, Lake, Thursday, January 11, 2018. Just a couple miles north from where they camped and water-skied sits a small island, the only one on the lake. More visible when the water is low, Bird Island is home, mostly, to seagulls. It was created by an underwater spring pushing up dirt from the bottom of the lake — a process Parker intends to somewhat mimic to form a city on the water. His plan would involve dredging the lakebed (to remove the buildup that causes algal blooms) and using that sand, mixed with gravel and rock, to make a handful of inhabitable islands. That would require moving about one billion cubic yards of sediment in several phases over five to eight years. “We did a lot of modeling over the years to really prove that this would work,” Parker said, noting that his team used software created at Brigham Young University, where he graduated. The islands would be shaped like seagulls and arches — with the largest one the outline of Delicate Arch — to supposedly cut down on wind disruption. About 10,000 acres would be used for development, including businesses and houses, and another 10,000 for recreation and green space. 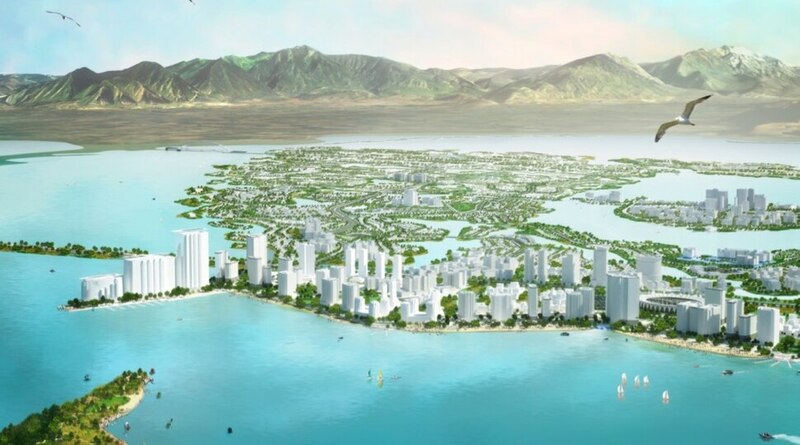 Overall, there would be roughly 31 square miles of new land from the islands, which is slightly smaller than Provo. The entire lakebed is about 150 square miles, about the size of Salt Lake City. Above all, Parker suggests, the proposal is about restoring the “broken ecosystem” around Utah Lake. He has plans to filter and treat the water, create miles of new trails and shoreline, replant native grasses, reintroduce Bonneville cutthroat trout and curb stormwater runoff and erosion. Steve Griffin | The Salt Lake Tribune Boaters enjoy the water at the Lindon Marina in Orem, Thursday, July 30, 2015. 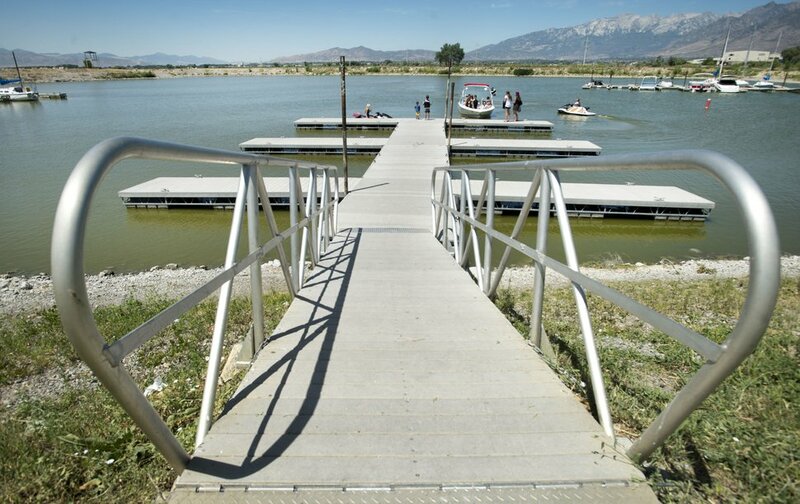 State water quality managers estimate 44 percent of Utah waterways are at risk for the same kinds of toxic algae plaguing Utah Lake. The toxins are blamed for two dog deaths and the demise of two cows. But the state has not allocated much, if any, funding for monitoring and treatment. But it comes at a massive cost. Parker estimates the Utah Lake Restoration Project, the brainchild of his brother Ben Parker, will come in at $6.4 billion, including $2.2 billion for the dredging alone. There’s also $565 million for a fish hatchery and species recovery, $550 million for more studies and research, and $900 million for wetlands restoration. And those might be modest estimates. His team has met with private investors who Parker believes can cover the upfront costs. And once the islands are developed, they can recoup the money. That could be 40 or more years out, though. He’s got a laundry list of questions: How would the arch-shaped islands control wind when there are mountains west of Utah Lake that already don’t shield the water from large gusts? How much deeper would the lake be after dredging? How would that effect its natural processes? How stable would the islands be? Since the lakebed belongs to the state, the plan will be reviewed first by the Utah Division of Forestry, Fire and State Lands. Two or three employees from the division will mark up the proposal with questions and requests for more information “through the lens of what’s in the best interest of Utah.” They’ll return it to Parker and the process will continue with other divisions under the Department of Natural Resources. Eric Ellis, executive director of the Utah Lake Commission, a group formed by the Legislature in 2009 to study the body of water, acknowledges there are “a phenomenal number of hurdles.” But he’s excited by the proposal. 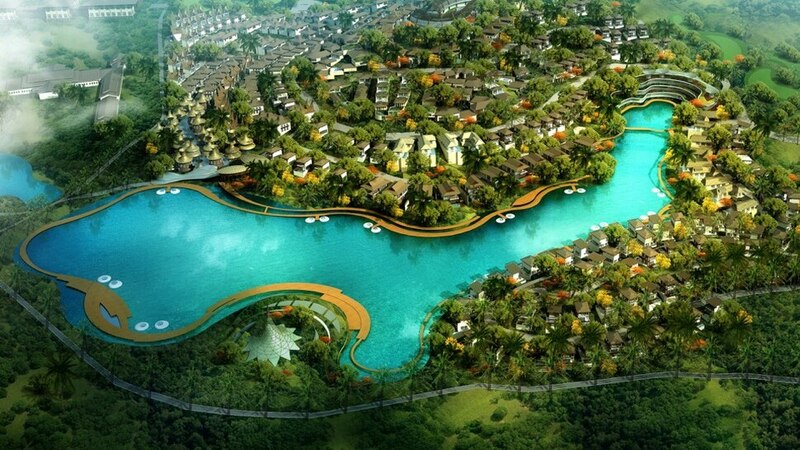 “I think it could be a model to lakes across the country,” he said. A similar project has been done already along the coast of Dubai, which sits on the Persian Gulf. Using the same process of dredging, engineers created an archipelago of islands where people live (though NASA suggested in 2011 that they are slowly sinking). Robert Scott, the lead design manager for that project, is now the chief design director on the Utah Lake proposal. Parker has heard most of the criticisms before. Francisco Kjolseth | The Salt Lake Tribune U.S. Geological Survey scientists conduct an experimental study on Utah lake on Wednesday, Aug. 10, 2016, to gain a better understanding of nutrient levels, which could help in understanding how to best manage algal bloom outbreaks. 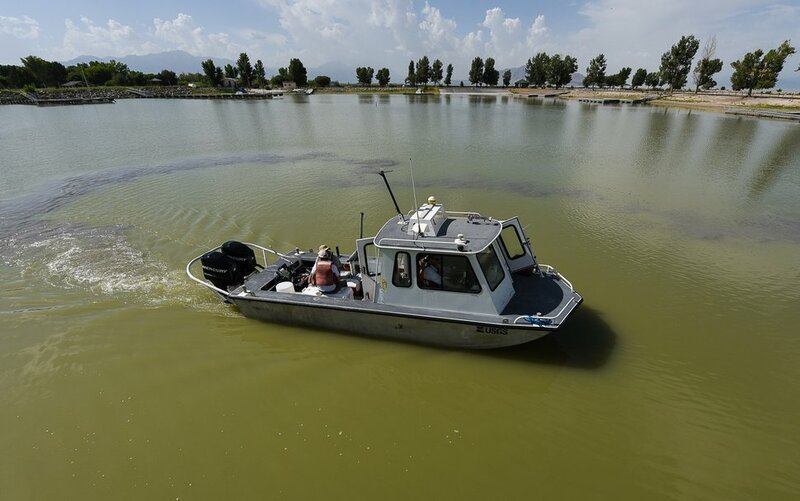 The pilot project is using new technology to measure the distribution, occurrence, and concentration of nutrients in in both Utah Lake and Gilbert Bay of the Great Salt Lake.